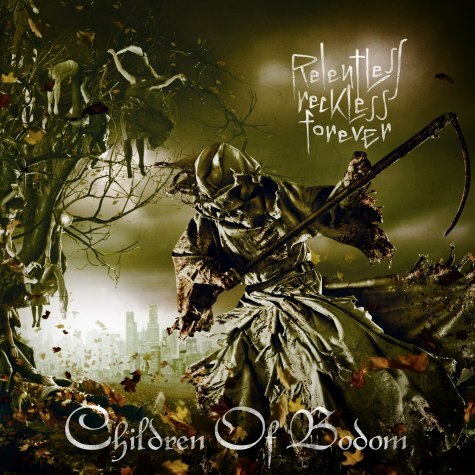 We’ve had previous discussions in these pages about the changes in Children of Bodom‘s music over time, and there seems to be a general feeling of nervousness about the quality of the band’s next album, Relentless Reckless Forever, which will be released on March 8 — particularly because the first single, “Was It Worth It?”, was an underwhelming effort. Today, the band officially put up a second single from the album for streaming on their Facebook page — though as far as I can tell, you have to “share” the thing on your own page in order to hear it. Then, of course, I found out the song has unofficially been up on YouTube for almost a solid week. A few other metal blogs tuned in to that development before we did, but maybe you’re just as slow on the uptake as we are. And just in case you haven’t already heard the song, you can listen to it after the jump. Ok, some thoughts. I’m not really liking it too much. I feel that when you instert sample clips you really run the risk of confusing and boring the listener. The song could have stood well enough on its own without that. That repetetive riff at the beginning of the song before the keyboards kicked in repeated too many times. I started to wonder whether it would ever end. The keyboards sound contrived, like the band put them in the song only because that is part of their ‘signature.’ The vocals are flat and uninspiring…that has always been my beef with CoB, which is why I never purchased any of their albums. That guitar solo in the middle was really good…and then it ended. I’m not going to be investing my money in CoB this time either. I can see your point about the riffs in the intro — perhaps too long — and I agree that the song ended a bit abruptly after the solo, but mainly because the solo was so damned good that I wanted more of it. As for the keyboards, yes they’re part of COB’s signature sound — I’d miss them if they weren’t there — and there are songs on recent albums where they do sound contrived, but I thought they fit well in this song and augmented rather than overwhelmed the guitar-driven nature of the music. I think we just disagree about the vocals. Alexi Laiho’s certainly not as good a vocalist as he is a guitarist, but I thought his vocals on this song were fine. Probably just a matter of taste.